As I told you all last post that I am really excited to bring some new additions to Miss Motives this year. Well today is the first day for one of the additions on my wishlist! Presenting to you, Motives Monday! Each Monday I will feature one product from the Motives by Loren Ridinger or Motives for La La cosmetic line. 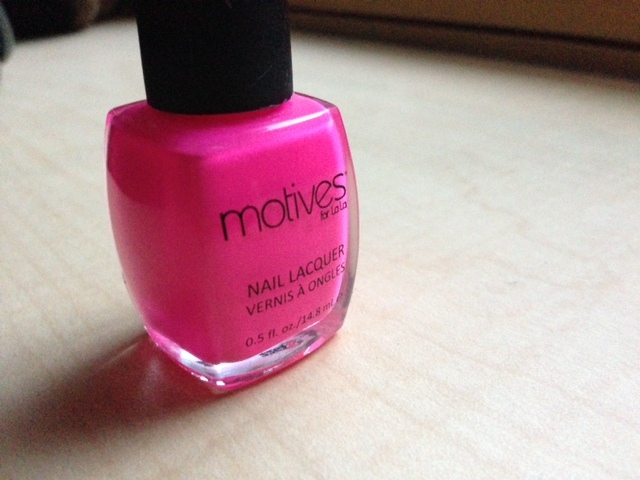 This week I’m going to start with my most recent nail polish obsession, the color Tonic from the Motives for La La Nail Lacquer! It’s such a bright, rich color and guaranteed to stand out above the rest. Being in the dead of winter up here, I most definitely needed a pick me up and this was the perfect go-to polish. This polish goes on beautifully, is chip-resistant and gives your fresh nails a flawless, glossy finish. It’s a similar polish formula to the well-known brand, Essie. But in my opinion our Motives Nail Lacquer line is absolutely outstanding and less expensive than many of the popular nail polish brands on the market. You can buy this nail polish here and shop www.missmotives.com for all other Motives products.